Dig out the cheerleader outfit and warm up the barbecue... it's time to plan your next Super Bowl Party! Check out these football and Super Bowl party supplies. 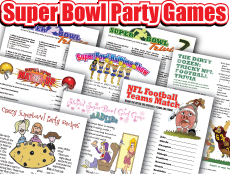 Purchase invitations from our Super Bowl Shop or use our free printable Super Bowl party invitations. There are two invitations per sheet. 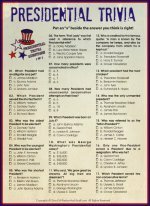 They will turn out best printed on card stock paper or any other heavy paper. After printing your Super Bowl invitations, you will need to cut the sheets in half and then fold each invitation along the dotted line. While folded cut around the outside edge of the football being sure to leave a small piece of the middle section at the top attached. You can then use the inside to include your party information. If for any reason you cannot download this invitation please contact us and we will do our best to get a copy to you. Decorate in team colors. If your guests favor different teams, decorate one side of the tv room in one team's colors and the other side of the room in their opponent's colors. Use tape to create a dividing line down the center of the room. Have pom-poms scattered about for decorating purposes and would-be cheerleaders. There is a great football field tablecloth available here as well as cool football shaped bowls, and numerous other fun decorating items. Maroon 5 will play the halftime show at Super Bowl 53! Lots of finger foods. Subs, chicken wings, chips and dips, pizza, nachos and of course, plenty of drinks. Kraft has an excellent selection of Super Bowl party recipes... everything from nacho dip to a football-shaped cheese ball. You'll especially love their Chocolate Football Bites. 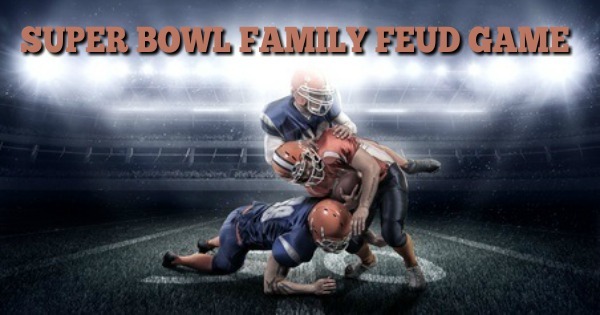 The highlight of a super bowl party is always the game, so be sure that nothing interferes with your guests' enjoyment of the show. Be sure all seats have a clear unobstructed view of the television. 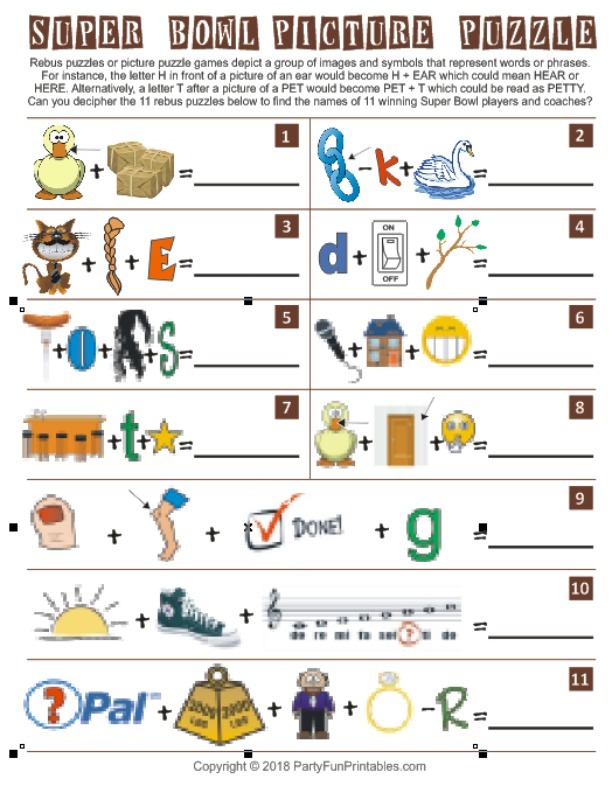 Both trivia games noted above are free and available in printable format. 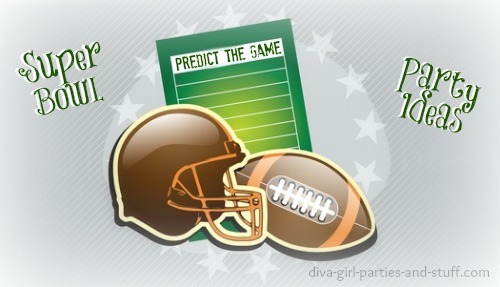 Before the game have your guests each take a guess at who will win and what the score will be. Whoever comes closest to the actual outcome of the game gets a door prize. 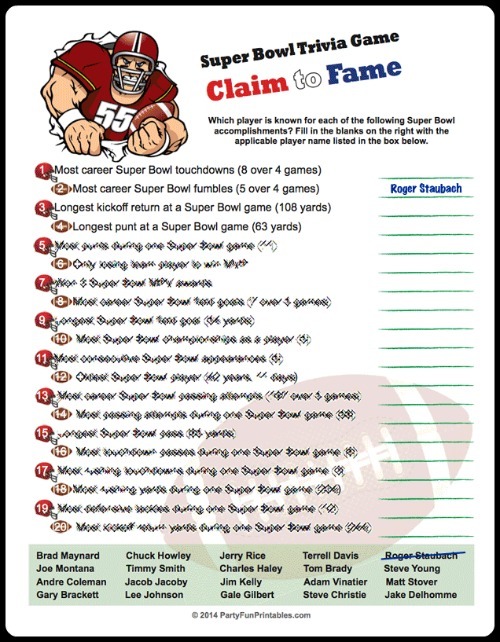 Also, have your guests guess how many touchdowns will occur in the game. 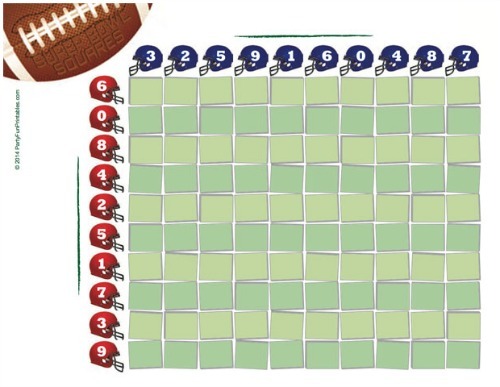 If there is a tie for the correct answer have the winners compete in a football kickoff. Whoever kicks the ball the furthest wins. Use a nerf ball indoors or a real foot ball outdoors. 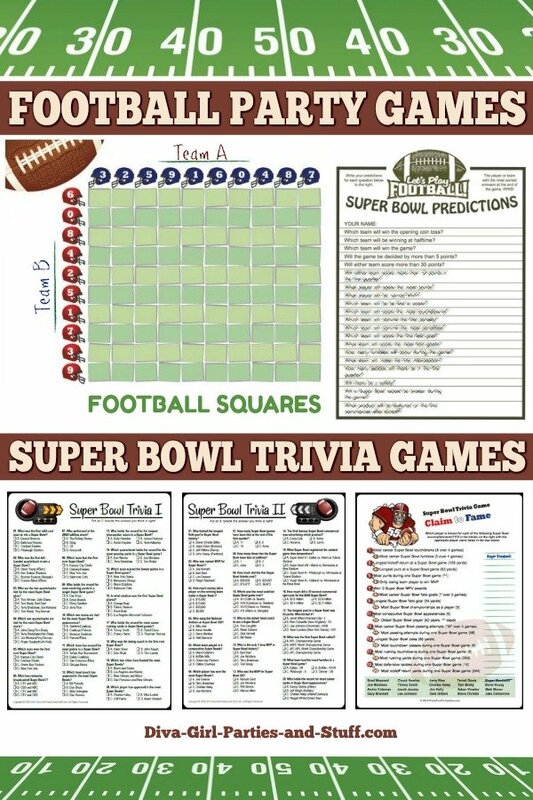 Get your free printable Super Bowl squares and game instructions HERE! 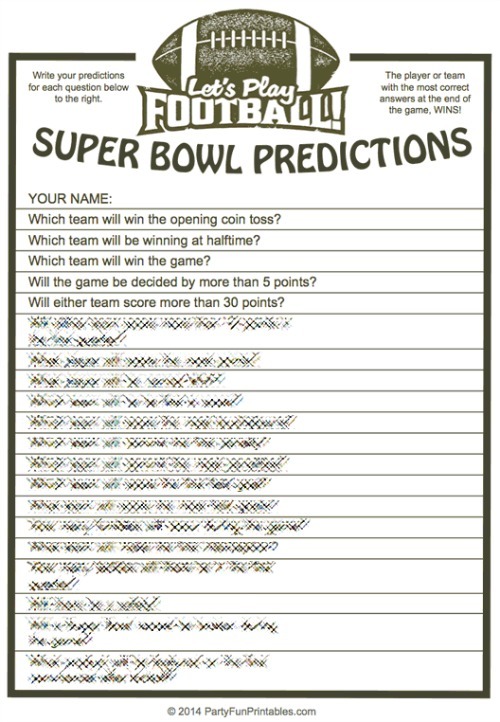 How Well Do You KNow Your Super Bowl Players ? Tickets to a local game, any applicable team merchandise or novelty football items. Favors are not really necessary, but if like handing out a parting "thank you for coming" trinket, try making some small cellophane goody bags with 3 or 4 of Krafts chocolate football bites (link above) or give each guest a small novelty football item.